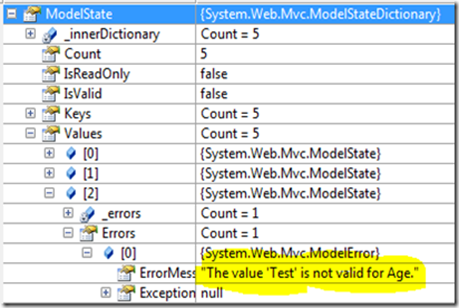 To get files into the MVC Controller Modelbinding from MVC is a clever method. But in fact it is a little bit complicated to set the error message if the connection failed. Problem: What happens if the user enters letters instead of numbers? Unfortunately it’s not that easy to change this message – all kinds of languages will be ignored. That doesn’t look nice on a German side. It’s not possible to run every kind of validation logic because the Framework isn’t able to attach the Property. Interestingly the reaction of the Framework is different if you try to allocate a higher number to the Int. In this case the ModelState receives an Exception you are able to catch. Also a validation could grip. I only have this problem in connection with String-entries.